Hailey Baldwin was spotted leaving a building in New York wearing an Iconic Roll-Neck Cashmere Sweater ($703.00) and matching Iconic Logo-Intarsia Cashmere Track Pants ($1,176.00) by Chloé, MM6 Maison Margiela Double-Breasted Checked Coat (Sold Out), Illesteva Milos Sunglasses ($195.00), Jennifer Fisher Mini Jamma Hoop Earrings ($450.00) and Acne Studios Steffey Leather Sneakers ($380.00). Kourtney was spotted heading to the park with her children in Malibu wearing a Vince. 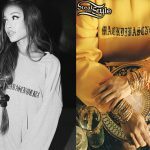 Ribbed Tank Top ($61.39), Yeezy Straight-Leg Jeans ($350.00), Illesteva Nimbin Cat-Eye Sunglasses ($220.00) and Yeezy Python Mid-Calf Boots ($695.00 – new season). 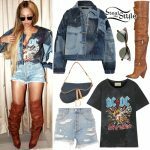 You can find similar style boots for less at Simmi ($56.00), Missguided ($60.00) and PrettyLittleThing ($60.00). Kourtney Kardashian was spotted filming for “Keeping Up With The Kardashians” at Petit Trois wearing a Yeezy Rib Tank ($80.00 – wrong color), Miaou Tommy Pants ($325.00), Illesteva Nimbin Cat-Eye Sunglasses ($220.00) and Yeezy Python Mid-Calf Boots ($695.00). Kourtney Kardashian was spotted out and about in Portofino wearing the Atlanta Crop Top ($122.00) and matching Atlanta Skort ($131.00) by For Love & Lemons, Illesteva Marianne Sunglasses ($190.00), a Christian Dior Saddle Clutch Bag (Sold Out) and Manolo Blahnik Lasatte Notched Flat Leather Slide Sandals ($645.00). Kourtney Kardashian posted some pictures on instagram wearing For Love & Lemons The Jackson Shirred Mini Dress (Sold Out), Illesteva Marianne Sunglasses ($190.00) and Manolo Blahnik Lasatte Notched Flat Leather Slide Sandals ($645.00). Bella Hadid posted some pictures on instagram wearing a Camilla and Marc Clarissa Off Shoulder Mini Dress ($550.00), a Gigi Burris Coco Straw Beret ($275.00), BaubleBar Avani Drop Earrings ($34.00), Illesteva Nimbin Sunglasses (Not available yet), a Nancy Gonzalez Billie Crocodile Box Bag ($2,100.00), and Dorateymur Leather Sling Back Pumps ($361.00). 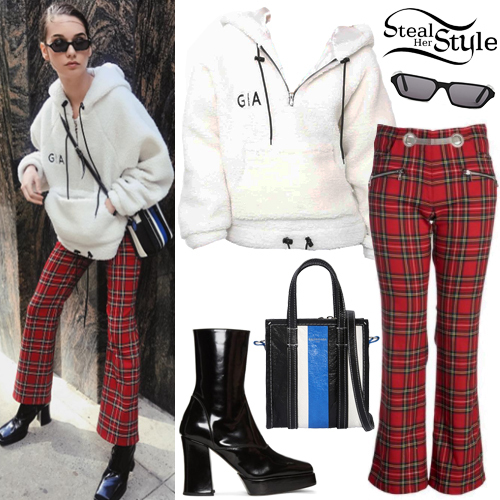 Amanda Steele posted a picture on instagram a couple of days ago wearing the I.AM.GIA Pixie 2.0 Jacket ($113.95), Miaou Morgan Plaid Pants ($325.00), a Balenciaga XXS Bazar Shopper Bag ($1,146.00), Illesteva Baxter Sunglasses ($230.00) and Helmut Lang Pleasure Patent Boots ($795.00 – wrong color). Kendall Jenner was spotted leaving the George V Hotel in Paris wearing a Belted Cropped Blazer ($2,200.00) and matching Herringbone Wool Slim-Leg Pants ($1,300.00) by Carmen March, Illesteva Marianne Sunglasses ($190.00) and Adidas Arkyn W Sneakers ($125.00).